Huge thanks to Steve from Philofaxy for graciously agreeing to do this excellent guest post! So you might be wondering what am I doing here on Plannerisms, surely this is a mistake, picked the wrong blog out of 'My Blogs' on Blogger... no not quite. I recently did a little bit of consultancy work for Quo Vadis in the USA with regards to them importing the Quo Vadis Organiser range of inserts in to the USA from France. It seems I am the world expert on planner hole spacing... what a sad fact to have on your CV! As a thank you for my time and input, Exaclair USA asked me if I would like a planner of my choice. This was actually quite a difficult thing to do for me. Firstly as you know I'm a 'ring bound' sort of guy. I've had bound diaries/planners in the past, but these have been HMSO/Niceday standard issue ones, no real choice other than 'Would you like a wall planner as well?' 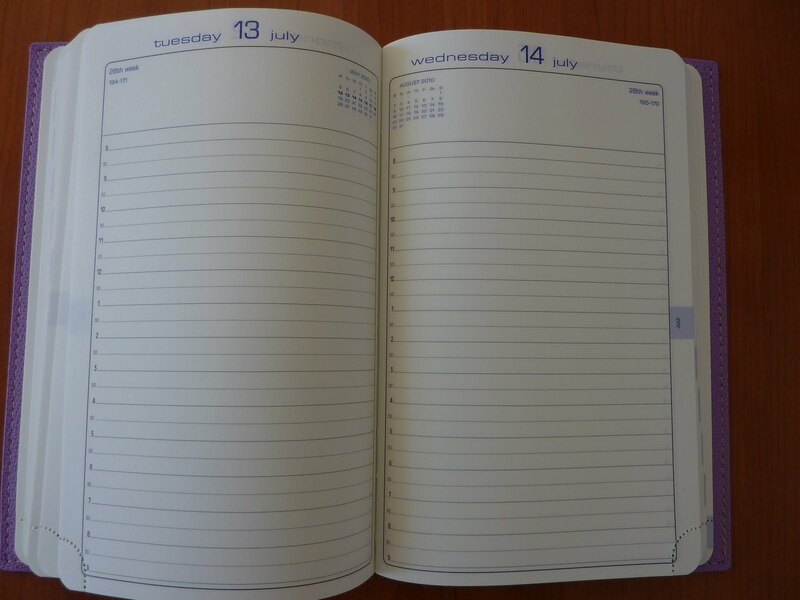 The Wall Planner tended to get more use than the bound diary. Anyway after consulting the Quo Vadis USA on-line site and looking through Plannerisms, which is a far more useful site for seeing the details of any planner than I ever would have thought, I chose the Journal 21 with a Club cover in blue. Now I have no intention of using the Journal 21 as a planner, instead I will use it as my Journal. Laurie's excellent review of the Journal 21, which I consulted and absorbed in detail here concentrates on using the Journal 21 as a planner in my language. Now for me... not living in the USA there are some issues with a USA produced planner as a planner in France. The public holidays aren't quite the same, but in terms of using this as a daily journal, the non UK/French Holidays I can just ignore and write in the UK/French ones at the top of the page or record them within the day as required. Looking at the Quo Vadis European website, the Journal 21 isn't available, instead there is the ABP1 which is similar in size and layout. This I believe is available in Canada. Of course being made in France the ABP1 will be in French where as the Journal 21 is English... US English, but unless anyone knows different we do spell the month and days the same! However, being a US product it will alert me to public holidays in the USA, which I am not aware of, and things like the changes to DST in Spring and back to normal in Autumn. Down the left hand side of each page are timings from 8am to 9pm in half hour intervals. I will most probably ignore these, although they might be handy for recording what I did in the morning, afternoon and evening. I'm not sure that I will use the monthly pages for anything at this stage, nor will I use the address pages at the back of the Journal 21. Overall I think this will be a great journal for me to use next year. I can leave my Filofax open on the planner pages, the Journal 21 open on the current day and this will prompt me to make more entries each day compared to now. I will be consulting Ray Blakes 'Journalling School' for some hints and tips as well. So yes it will be possible to mix ring bound and bound planners! Yes I didn't think I would ever say that either! Thank you to Sunny at Exaclair for supplying the Journal 21 and to Laurie for letting me share this post with you. I was at Barnes & Noble the other day and that's exactly what I was looking for. They didn't have it or anything like it. Sadly yes! Hours of boring research... never let anyone tell you I avoid serious work! I nominated you for a Liebster Blog Award! Nice to see you here Steve! Love Laurie's blog and this planner looks like it would make a terrific journal! Interesting idea - to mix the ring bound planner with a hard bound journal. I am still so confused about the right planner for me. I always thought I would hate the bound versions and have since fallen in love with same - but I really can't handle not being able to add extra pages when needed. My other problem is size. I prefer US Letter size but they are way to heavy for me to carry with me.